These specialized tying the knot wedding koozies are the perfect wedding favor for all your guests. The front of this koozie features a knot being tied in the shape of a heart and the back features a personalized message that can include the phrase "Tying The Knot" along with the names and date of the nuptials. This koozie features an attractive design that will sure to get plenty of use by your guests through the years. Our Tying The Knot koozie features 25 different material colors and another 25 types of ink. 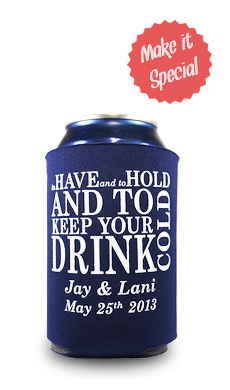 This wedding koozie's cute design and slick look is something that you'd better "knot" pass up! Enter any changes (name, date or layout in the comments section on the next page) to our stock design. We will make the changes and e-mail a final pdf proof before we go to print.